Published in the Official Journal on 6 November 2007, page 27. Council voting list, including full document references with corrigendums. Full information on the negotiations can also be accessed from Pre-lex. 25/5/2007 : The European Commission adopts its opinion on the European Parliaments report in recond reading (COM(2007)294 of 25.5.2007). 25/04/2007 : The European Parliament adopts a compromise package agreed with the Council on the Directive on the assessment and management of flood risks. Final adoption by the Council is expected later in 2007. 6/12/2006 : The Commission's Communication COM(2006)775 to the European Parliament on the Council's Common Position on the Directive on the assessment and management of floods is adopted. 23/11/2006 : The Council adopts the Common Position on the "Directive on the assessment and management of flood risks"
For full documentation please go to the Council's document search engine (Please note that some linguistic revisions are still foreseen before transmission to the European Parliament). "Evaluation of the impacts of floods and associated protection policies", April 2005, by Office International de l’Eau and Ecologic. English. 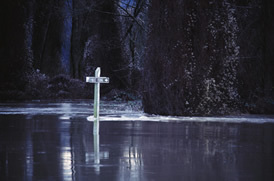 Good Practice for Delivering Flood-Related Information to the General Public, 2007. A "Handbook on good practices for flood mapping in Europe" 2007, including the "Atlas of Flood Maps, with examples from 19 European countries, USA and Japan" ! One of the key activities under the joint implementation of the Water Framework Directive (WFD) is the improvement of the information exchange between Countries, European institutions, the various stakeholders and the interested public. In order to promote greater information exchange and to facilitate the work in the numerous expert groups, the Commission set up an internet-based platform called "CIRCA" which has recently migrated to a new platform called "CIRCABC". CIRCABC stands for "Communication and Information Resource Centre for Administrations, Businesses and Citizens" and it is a web-based service provided by the European Commission. It is used to create collaborative workspaces where communities of users can work together and share information and resources. CIRCABC is financed by the ISA. The Directorate General for Informatics at the European Commission (DG DIGIT) is responsible for coordinating the development and the user community. It hosts the application and provides helpdesk and support. In line with the principle of transparency, all sections of the "WFD CIRCABC" library are accessible to the public except for the WFD Article 21 Committee which is accessible only to registered Committee Members. Measures to ensure personal data protection: from now on the minutes of the CIS meetings will contain the name and organisation of the participants, without further personal data (no email, no address, no telephone). If you have any questions, or are experiencing problems accessing the information exchange platform, please contact the EC Central Help Desk and ask them to open a call and assign it to DIGIT-CIRCABC-SUPPORT@ec.europa.eu. If you need any help regarding the use of the CIRCABC tool, please consult "CIRCABC Help" which consists of a series of "frequently asked questions" focusing on each CIRCABC service. Alternatively, you can send an email to the "Water Mailbox" of the Environment Directorate-General. The documents available in WFD CIRCABC have been developed in the context of the Common Implementation Strategy (CIS), a collaborative programme involving the European Commission, all the Member States, the Accession Countries, Norway and other stakeholders and Non-Governmental Organisations. The documents should be regarded as presenting an informal consensus position on best practice agreed by all partners. However, the documents do not necessarily represent the official, formal position of any of the partners. This means that the views expressed in the documents do not necessarily represent the views of the European Commission. Neither the European Commission nor any other CIS partners are responsible for the use that any third party might make of the information contained in these documents.